The 24 Hours of Le Mans (24 Heures du Mans) is a sports car endurance race held annually since 1923 near the town of Le Mans, Sarthe, France. Commonly known as the Grand Prix of Endurance, it is organised by the Automobile Club de l'Ouest (ACO) and run on a circuit containing closed public roads that are meant not only to test a car and driver's ability to be quick, but also to last over a 24-hour period. At a time when Grand Prix racing was occurring throughout Europe, Le Mans was envisioned as a different test from motorsports at the time. Instead of focusing on the ability of a car company to build the fastest machines of the time, the 24 Hours of Le Mans would instead concentrate on the ability of manufacturers to build sporty yet reliable cars. This would drive innovation in not only reliable but also fuel-efficient vehicles, since the nature of endurance racing requires as little time to be spent in the pits as possible. Beginning in the late 1970s, the demand for fuel economy from around the world led the race to adopt a fuel economy formula known as Group C in which competitors were given a set amount of fuel, from which they had to design an engine. 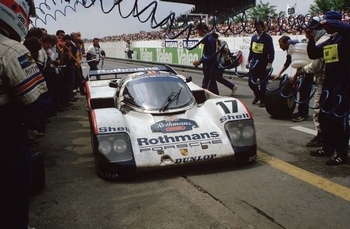 Although Group C was abandoned when teams were able to master the fuel formulas, fuel economy would still be important to some teams as alternative fuel sources would appear in the early 21st century, attempting to overcome time spent during pit stops. 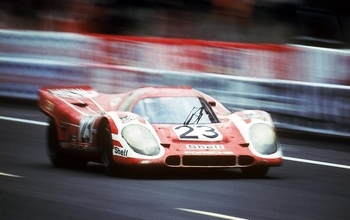 These technological innovations have had a trickle-down effect, with technology used at Le Mans finding its way into production cars several years later. This has also led to faster and more exotic supercars due to manufacturers wishing to develop faster road cars for the purposes of developing them into even faster GT cars. Steve McQueen, the king of cool, met his match in this film, whose real stars are the Porsches and Ferraris he and his competitors race. 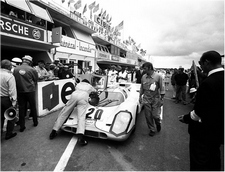 American driver Michael Delaney, played by McQueen, pilots a Porsche 917 in the grueling annual 24-hour race in Le Mans, France. 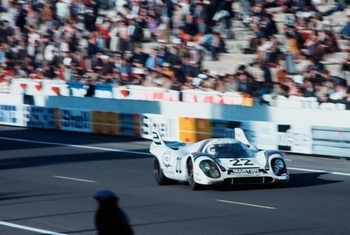 Like another notable racing film of the era, Grand Prix, Le Mans makes an obligatory attempt at a plot, again involving racers' love lives and again, who cares when there's a Porsche packing a flat V12, taking turns at 200 mph. 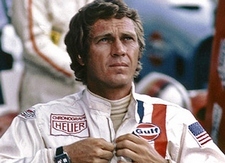 McQueen himself a racing buff, had previously participated in the 1970 12 Hours of Sebring race and hoped to enter Le Mans as part of the film. 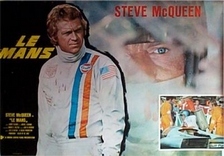 Although McQueen placed second at Sebring, the films producers balked at the idea and the film was shot with professional drivers. Regardless, McQueen who showcased some serious driving chops in Bullitt, is probably the only man who can up the cool-quotient of a Porsche 917, when he's behind the wheel. The “Circuit de la Sarthe” track, named after the river Sarthe, is composed partly of public roads and currently measures slightly less than 14 kilometres in length. Spending almost 75% at full throttle and achieving maximum speeds in excess of 340 km/h, the fastest vehicles cover more than 5000 km during the 24 Hours. 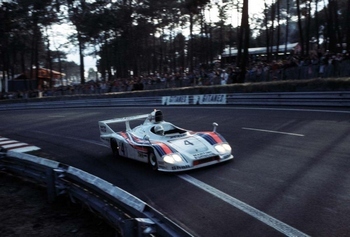 To this day, these key data represent precisely what the Le Mans 24 Hours was originally planned as: a long-distance race during which automotive manufacturers can put the reliability and development status of their vehicles to the test and prove their capabilities. No wonder that Porsche has written its name into the annals of this race as a record participant and a record winner: Since 1951, there has always been at least one Porsche on the starting grid of the Le Mans 24 Hours. 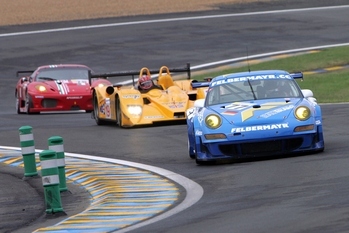 This means that a total of more than 600 Porsche vehicles have taken part in this race. To date, with prototypes and GT vehicles, 16 overall victories and 94 class wins have been achieved. The first victory was back in 1951 with a 356 aluminium-bodied coupe, and the most recent was in 2007 with a 911 GT3 RSR driven by the French private team of IMSA Matmut and the two Porsche works drivers Patrick Long and Richard Lietz as well as private driver Raymond Narac. In accordance with the latest ACO technical regulations, two prototypes classes (“LMP1” and “LMP2”) and two GT classes (“GT1” and “GT2”) are hoping to drive their way to victory. 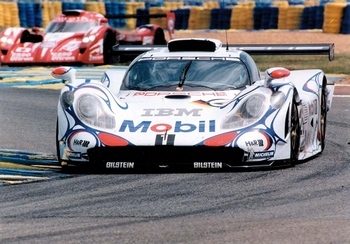 LMP1 and GT1 are intended primarily for works teams, while LMP2 and GT2 are aimed at private teams. Since Porsche places such great emphasis on customer motor racing, the RS Spyder is an LMP2 sports car, while the 911 GT3 RSR is classed as a GT2 vehicle. To take part in the Le Mans 24 Hours, you need to achieve 1st or 2nd place in the previous year, or to have qualified as champion or vice champion in the Le Mans Series, the American Le Mans Series or the FIA-GT. Further to this, ACO the event organizer extends invitations to other teams.